Our 100% lead-free crystal wine decanter exceeds our competitor in every aspect! Our 8.5in wide bottom diameter is the largest diameter you can find in the market, which is important because it allows for maximum oxygenation of your wine to enhance the purity, aroma and taste! Our wine carafe decanter is hand blown and strategically designed to hold a standard 750ml bottle or up to 1800 ML of wine at the widest point of the decanter. 100% lead-free crystal gives the carafe an unmatched beauty and clarity that will illuminate any room. The wine carafe & wine decanter also features a slanted top for easy and elegant pouring, while avoid spills and drips. Our wine decanter is perfect for wine gifts and is one of the most important wine accessories! This 100% lead free crystal glass wine decanter is the perfect additional to any wine set. 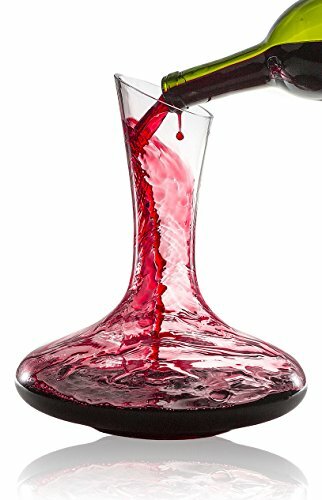 Completely hand-blown and made of crystal glass, this wine decanter will improve the purity, flavor, and aroma of your red wines instantaneously with each pour. As soon as you pour your bottle of red or white wine into the wine carafe, the air that immediately hits the wine oxygenates the wine and release the true authentic flavors of the wine. This wine decanter is perfect for your standard 750 ML bottle of wine, even though the decanter itself can fit over 1,800 ML's of liquid volume. ★ HAND CRAFTED WINE DECANTER - Allow your wine to breath by pouring it in our elegant 750 mL wine aerator and wine decanter. Made of crystal, this wine pourer perfectly oxygenates your wine with every pour enhancing the flavor profile and releasing the rich aromas of your favorite wines. ★ 100% LEAD FREE CRYSTAL WINE CARAFE - Our hand-blown lead-free crystal adds radiance and luxury to any room you're serving wine. Our wine decanter comes packaged in a beautiful gift packaging standard to the Bar Brat brand. ★ EASY WINE POUR FOR PERFECT POURS - Avoid annoying spills & elongated drips with our specially designed slanted top. ★ PERFECTLY HOLDS 1800 ML OF WINE - Don't be tricked by other manufacturers claiming their decanter has a volumetric capacity of 1700ml or more. The volume is pointless! What really matters is how much breathable surface area 1 bottle of wine is exposed to in the carafe. ★ 100% LIFETIME MONEY BACK GUARANTEE - If you are not satisfied with the wine decanter, we will refund you your money, no questions asked. We have that much confidence in the beauty, design, and functionality of the Bar Brat French Press Coffee Maker. If you have any questions about this product by Bar Brat, contact us by completing and submitting the form below. If you are looking for a specif part number, please include it with your message.